One of the myriad benefits of having children is once again seeing things as a child. The innocence and believability of all things great and small becomes real again through the eyes of our children. For instance, as we grow older, Christmas often loses its luster as we focus on the negative aspects of the holiday: budgeting gifts, wrapping those gifts, spreading ourselves thin as we try to visit ALL the relatives, losing the extra pounds gained, etc. etc. But now that I have children, especially one that truly believes in Santa, the holiday has a renewed beauty. Disneyland regained the same luster when we took Dylan for her first trip last week. The colors were brighter, the people nicer and everywhere I looked I saw magic. I felt positively giddy when I saw the castle and wanted to shriek when I saw princess characters floating about. We bought Dylan an autograph book for meeting the characters, but really I felt like I wanted my own. In all the years that I have visited Disneyland, this was the first time I actually watched the fireworks show (back in the day it was the BEST time to ride rides because everyone else was watching the show!) and I actually felt like weeping. The beauty and surprise of the fireworks left me feeling astounded. The carousel held new magnificence to my childlike eyes and I rode right along with Dylan and my sister-in-law, Ileene. It has been years since I actually rode one; I normally stand next to Dylan, now she’s big enough to ride alone, but I couldn’t pass up the opportunity to feel the magic too. I couldn’t tell Dylan no, when she wanted something I bought it… or my brother, Tommy did! I was brokenhearted when she lost a Tinkerbelle toy, and then promptly bought her another. 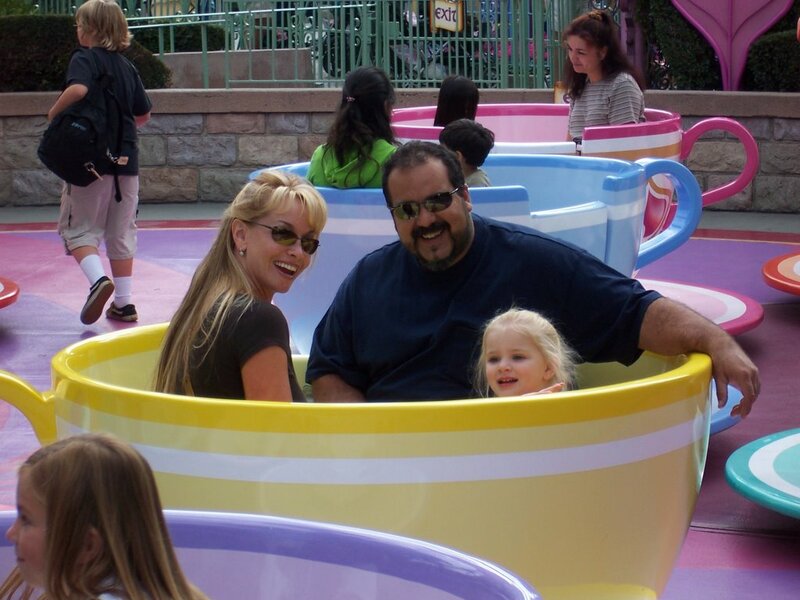 I could have watched her on the teacups for the rest of my life and then died a happy person. Then I rode them with her and life somehow became even better. She screamed and laughed; I screamed and laughed, too. Watching Dylan’s face light up when she first saw Pluto made me feel like I might explode with gratitude. I’m not a big believer in God, but I thanked whomever for allowing me to be there for that exact moment in her life. Disneyland is magical. Thank you, Dylan, for helping me to SEE again! So true Kathy....thanks for reminding me to see things through their eyes.